Even workers toiling at desk jobs and other seemingly safe professions are facing stresses that are hazardous to their health, including long hours, job insecurity and lack of work-life balance issues, a new study reveals. These types of workplace stress contribute to at least 120,000 deaths each year and account for up to $190 billion in health care costs, according to research by two Stanford professors and a former Stanford doctoral student now at Harvard Business School, announced in late February. Overall, the 10 stressors taken together increase national health care costs by 5-8 percent, they found. Job insecurity increases the odds of workers self-reporting poor physical health by 50 percent and poor mental health by about 40 percent, according to charts presented with an announcement of the findings. The most significant stressor is work-family conflict, increasing the odds of self-reported physical illness by roughly 85 percent. 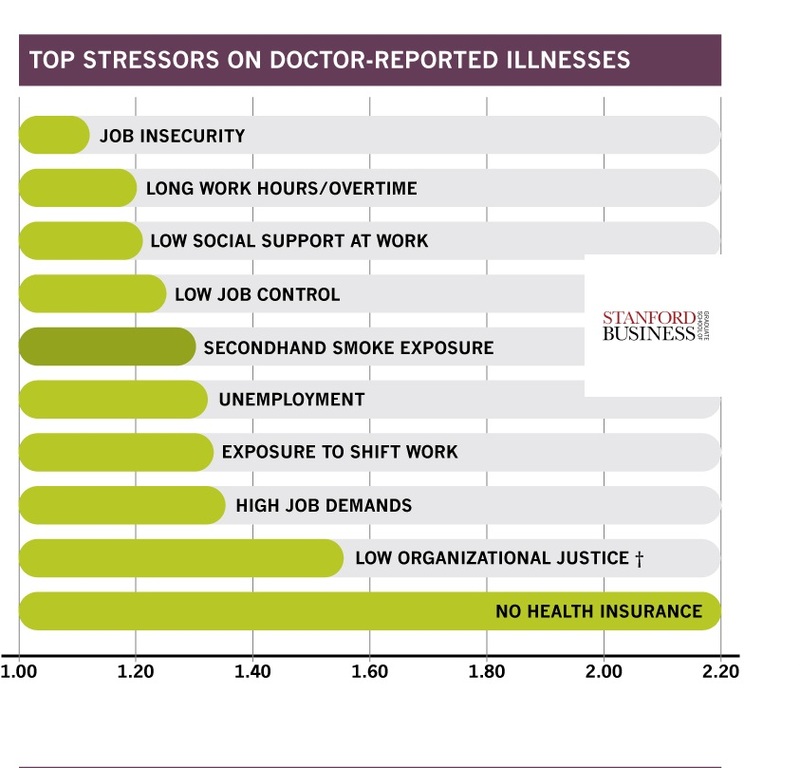 Far and away, the most significant stress factor associated with doctor-reported illnesses is lack of health insurance. “No health insurance increased the odds of a physician-diagnosed health condition by more than 100 percent,” the researchers found. Low organizational justice and high job demands are also associated with more doctor reports of illness. What else might kill you? 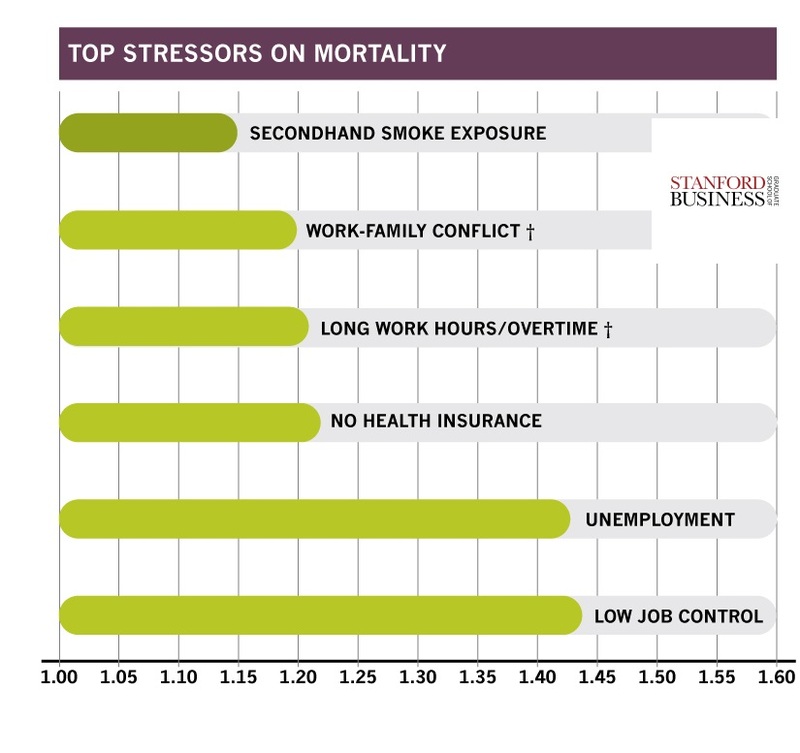 The most significant stressor on mortality among the 10 analyzed by the researchers is low job control, which increased mortality rates by almost 45 percent. 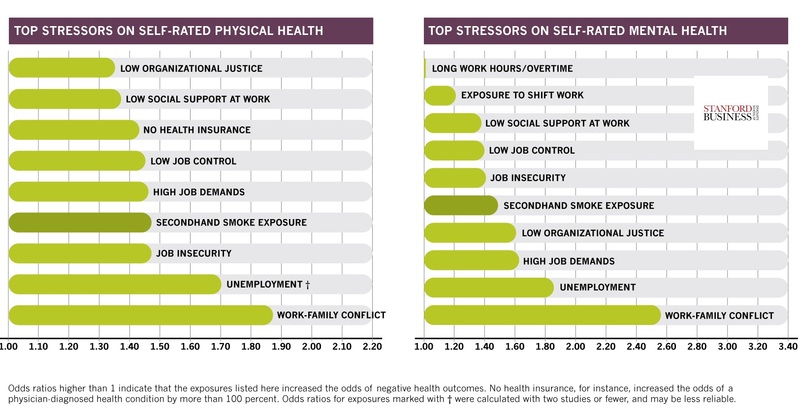 The stressor with the biggest impact overall is lack of health insurance. It ranks high in both increasing mortality and health care costs. Another big driver of early death is economic insecurity, captured in part by unemployment, layoffs and low job control. 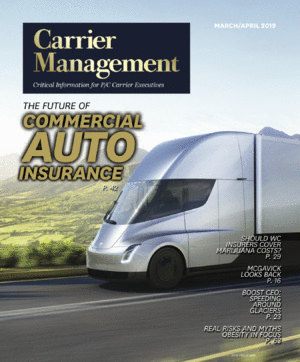 Pfeffer said that while the ramifications of being uninsured came as no surprise, what did surprise the team was the high impact of psychological stressors. Work-family conflict and work injustice had just as much impact on health as long work hours or shift work. For example, employees who reported that their work demands prevented them from meeting their family obligations or vice versa were 90 percent more likely to self-report poor physical health, the researchers noted. And employees who perceive their workplaces as being unfair are about 50 percent more likely to develop a physician-diagnosed condition. The researchers acknowledge that their study has limitations. Chief among them is the fact that they are unable to make strong causal inference linking these stressors to poor health because the studies they used are observational. Pfeffer believes the findings have implications for the design of wellness programs. Organizations, including Stanford, institute wellness programs that focus on encouraging employees to eat better or exercise more. Meanwhile, these companies overlook the atmosphere of workplace setting itself, he noted. Smoking cessation programs or incentives to lose weight focus on individual behavior and ignore management practices that create stress and set the context for employee choices. Beyond the workplace, Pfeffer advocated government tax incentives that would encourage employers to offer more work-family balance or reduce layoffs. “Nonregulatory actions like guidelines or best practices might also prove fruitful” at the government level, he suggested.